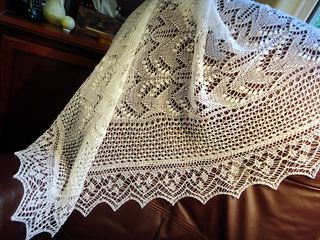 Shetland meets Estland: a shawl with nupps in the middle and a border with true lace edging from Shetland Isles. 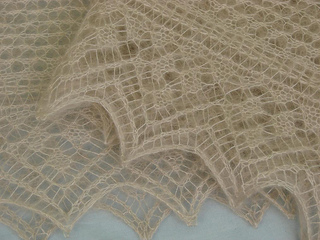 This pattern includes 1 pattern with knit/knit lace-rows and 2 patterns in knit/purl rows and nupps. 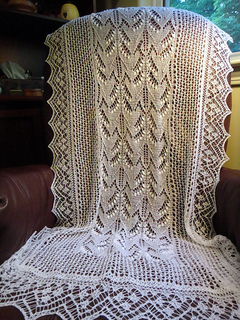 There for I qualify it for intermediate knitters. Charts only, pictures included and detailed written instructions. The charts are nót written out. Approx. 80 x 190cm Blocked! NOTE : due to personal knitting tension, you might want to have a 6th ball of yarn available. I was left with only a few meters of the fifth ball. Twin Pearls 4.0 is the latest updated version. Charts are easier to read now.